After two trips to the old city on Saturday to visit a lock store (which gave me the opportunity to see horses on the expressway while driving there), I needed to make a third and final visit on Monday, since the store was closed by the time I arrived on my second trip Saturday. This time, facing the prospect of weekday traffic, I decided to ride the Khlong (canal) Saen Saeb express boat into the old city. 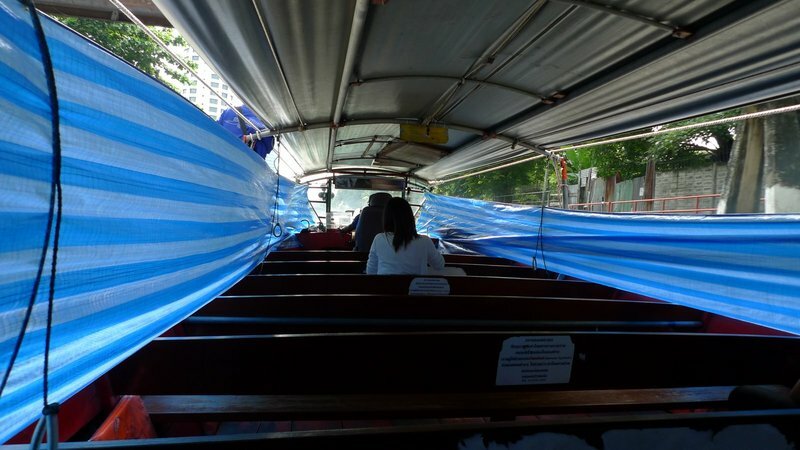 I’ve written before about the Saen Saeb express boat in an entry about a journey on seven modes of transport in Bangkok. It is an 18-kilometer water route that cuts east-west through the middle of the greater Bangkok area, running from the northeastern outskirts of Bangkapi all the way to the edge of Rattanakosin Island, stopping adjacent to the Golden Mount. While the water is filthy and the boats are very crowded during rush hour, the express boats are not only an interesting way to get around, they are also a bargain with fares topping out at 20 baht, or about 65 American cents. While the inbound ride was packed – some 50 people sitting and another 30 or so standing – the return trip from the heart of the city at 9:00 am was almost completely empty, just me an a handful of passengers. This gave me a chance to appreciate the breeze, which makes the canal express boats one of the coolest ways to travel. However, with the murky water sometimes splashing over the plastic barriers, your risk of Hepatitis A infection is also higher on the boats than on any other form of transit. 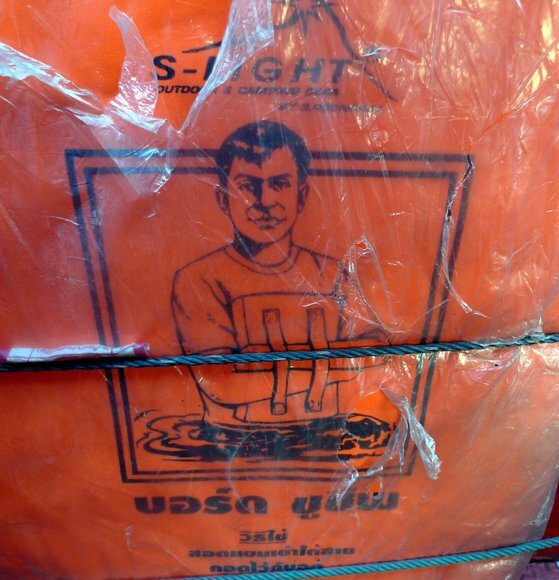 While enjoying the less crowded ride back home, I noticed the safety equipment that is lashed to the inside of the boat: flotation devices with a rather sinister man demonstrating their proper use. His reminds me a bit of Sean Connery as James Bond. What disturbs me, though, is not that James Bond is demonstrating the floatation devices. What disturbs me is that the man appears to be standing in water that is only hip-deep. If you’ve seen the water in Khlong Saen Saeb, you wouldn’t blame him! 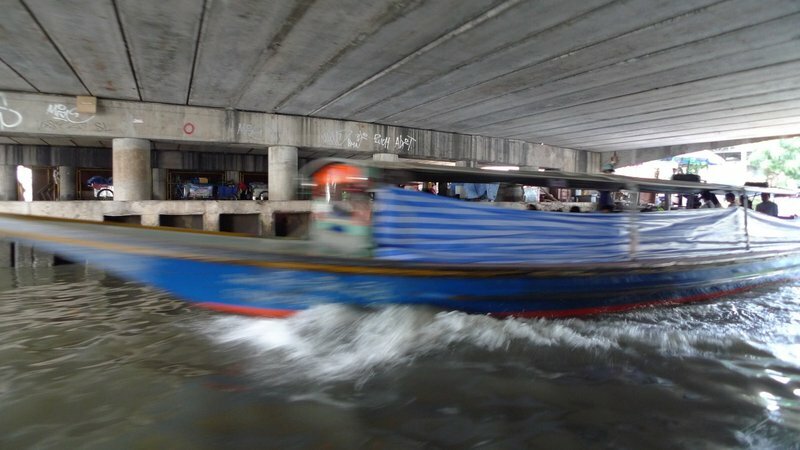 This entry was posted in Uncategorized and tagged Bangkok, boat, canal, express, Khlong, Krungthep, River, Saen Saeb, taxi, Thailand, transit, travel by christao408. Bookmark the permalink. I did that on the last trip, riding the river express boats saved a ton of time. It was crowded too, with standing room only, but kinda fun and we enjoyed the river scene! That guy = so much swag. haha he does look sinister. Does look angry but maybe that has to do with the water in which he is standing. Sinister is just the word. Interesting mode of transportation. Question: Where do people stand in a full boat? I mean, it looks like the seats run side to side and fill the whole length of the boat. fun and danger mixed together. Strange bedfellows I should say. @murisopsis – If you look carefully on the right-hand side of the first picture, you can see people standing. There’s a section near the middle of the boat (close to the engine) which is standing only. The second photo depicted only the front third or so of the boat. @Fatcat723 – Ha ha ha! @Inciteful – @yang1815 – @Roadlesstaken – @I_love_Burma – I’m curious who the artist’s model was? Self-portrait, perhaps? Frustrated artist who is making graphics for flotation devices. @CurryPuffy – On a warm day, the canal and river taxis are the best bet for getting a bit of a breeze. @ZSA_MD – Like oil and vinegar! Ha ha! I didn’t think there’s room for 30 folks to stand in that boat. I guess the water spray can be a bit dangerous, I never thought about that.